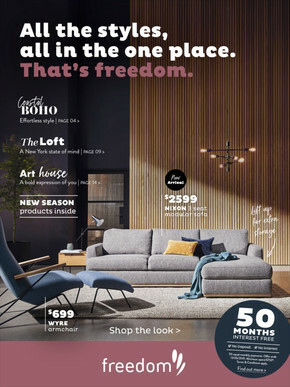 Freedom is a leading furniture retailer based in Australia and New Zealand. 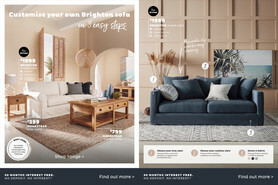 Browse Freedom’s catalogues and weekly ads online for the latest deals on fabric sofas, leather sofas, bedroom furniture, dining room furniture and homewares. Can’t wait to make your next purchase but don’t have the funds to do so? Freedom offers a wide range of everyday Interest Free Payment Plans so you can buy now and pay later. Choose from flexible payment options to suit your lifestyle and budget. You also have the option to make extra payments at any time to reduce your balance. Plans include 0% interest for 6 months, 12 months or 24 months. You won’t want to shop anywhere else! Become a MyFreedom member and enjoy a range of benefits. It’s jam-packed full of year-round rewards such as 15% off full priced products, 5% off promotional prices and 5% off selected products from Freedom Kitchens. You’ll also receive a $50 Birthday Gift Credit per annum, 1 instore consultation with a Freedom Decorator, and invitations to exclusive events, previews and sales. Visit Shopfully site and app for up-to-date information on opening hours, store locations, and to browse the latest flyer for outstanding offers.